Project Note: Use disposable gloves to protect your hands from the messiness of this project. Cover a level working surface with a disposable tablecloth. Hot glue a 6"x6" canvas to the center of the 12"x12" canvas and place in the center of the disposable tablecloth. TIP: For a fun flair, attach it at an angle as shown. Pour some Titanium White paint into one of the disposable cups. Add a small amount of water and mix well. The water should thin the paint enough to pour out of the cup. 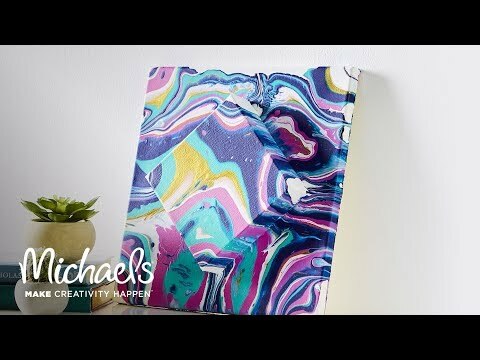 Prime the canvases with this paint mixture. Use a jumbo craft stick to spread the paint evenly over the top of the canvases. Add more Titanium White to the cup and add more water. This time, thin the paint even more with water. The paint mixture should be easily poured from the cup. Pour each color of paint in separate cups and add water to thin paint to same consistency as the white in Step 5. Mix water well into the paint. Hold one cup of paint mixture above the canvases, in the center, and pour a little puddle on the top. Repeat Step 7 with all colors, alternating colors, without a specific pattern, until all paint has been poured. Allow the paint to move naturally down the stacked canvases. TIP: Flick the excess paint left in the cups and on the jumbo craft sticks over the canvas, randomly. Let dry completely. Once dry, lift from the disposable tablecloth and cut away the excess paint around the sides. Artist's Loft® Acrylic Paint, 4 oz. Metallic Acrylic Paint by Artist's Loft®, 4oz.